The Asus Padfone 2 was announced just prior to the 1080p boom of 2013 but still has qualities everyone loves and yearns for in a smartphone – capacious 720p screen, potent quad-core processor, pixel-rich camera, Android Jelly Bean, etc. And coupled with a slate it’s a really hard to beat combo, price-wise. But does its battery have the chops to last for more than a day – find out in the breakdown after the break. 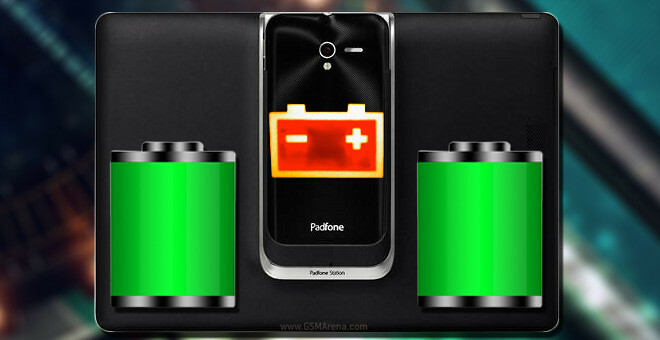 The tablet part of the Asus Padfone 2 has its own separate battery, which it shares with the smartphone – charging it while docked. We measured that the Padfone station charges the Padfone 2 by 44% per hour and it takes about 2 hours and 15 minutes to charge the phone to 100%. When on its own the Padfone 2 can last an impressive 11 hours and 20 minutes while on a call. It’s a solid result and well above the middle of the pack. 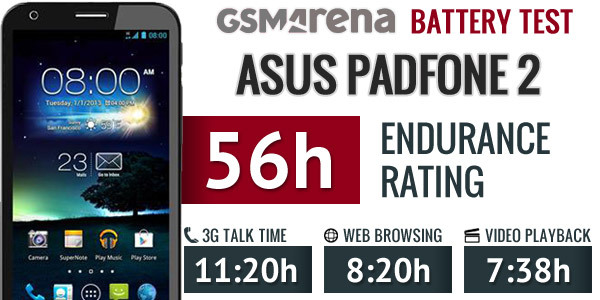 Web browsing was equally impressive – the Padfone 2 can surf the web without breaking a sweat for 8 hours and 20 minutes. Finally, we come to video playback. You can watch about 3 full-length videos on the Asus Padfone 2. It managed to last for 7 hours and 38 minutes – that’s with brightness at 50% and the speakers down to 10% – if you crank up any of those, the Padfone 2 battery will take a performance hit but should still allow you to fill-in a long flight hassle-free. So there you have it – an inspiring 56 hour endurance rating. For those of you who aren’t familiar with out lingo that means that you’ll need to charge the Padfone 2 every 56 hours if you challenge it with an hour of calling, web browsing and video playback a day. The plus side here is that you can always dock it into the slate and in no less that two and a quarter hours you’ll get it back fully charged.